This weekend we were the guests of Outdoor + Active, a fantastic adventure activity centre nestled into the South East corner of Exmoor National Park. With a glut of water sports activities on their perfect lake side location, and an equally impressive array of land based action, we were seriously impressed with what this centre had to offer families. If you’re like us – an outdoorsy family, loving anything with a faintly adventurous whiff, then put this place firmly on your radar! Outdoor + Active, the largest combined activity centre in the South West threw open their doors last weekend for their annual Open Day offering families from far & wide a taste of adventure.With 400 acres of water, Outdoor + Active are able to offer a huge choice of water sports from kayaking, canoeing, dinghy sailing, SUP, windsurfing to Mega SUP, all in a fun & safe environment. And if you don’t fancy getting wet, try a whole host of exciting experiences from archery, indoor climbing, high ropes to orienteering or even dabbling in a little bushcraft. The Open Day gave us the chance to do some of our favourite activities and the chance to try something new – all for the price of peanuts. Each activity cost from £3.00 – 5.00 a session and lasted a full 50 minutes – fantastic value. We were booked first into High Ropes (minimum age 8), which I presumed was a tree top experience – not so! Climbing into harnesses and securing our hard hats, we craned our necks to see an assault course dangling 40ft off the ground. Not for the faint hearted this adventure playground forces you to confront your fears and swing (or cling!) through the air like monkeys. Truly testing your nerve, you need a bold disposition to even leave the launch platform. Safety is paramount. We were fully harnessed in & attached by lanyards to a rail above throughout the whole experience – not that this bolstered my confidence. Minnie, our 8 year old, managed the first couple of obstacles then had to turn back – it was just way too high. After leaping from one perch to the next I came a cropper only one third of the way round the course – one single rope spanning 10 metres. With rasping breath I stared hard at it wishing it would go away. Paralyzed with fear I couldn’t draw my eyes off the forest floor way down below. With my heart literally banging in my chest and rationalizing in the safety of my harness, I galvanized myself, drawing on every drop of courage I could muster to place my foot on the wobbling wire and reach, starfish like, to the sliding hand hold a metre away. 30 seconds later and I was safely on the next column. I purposefully raced round the remainder of the course, in the knowledge that that waiting and watching clearly is the worst enemy. Maybe it’s an age thing! I saw lots of kids racing around, saucer grins on their faces. I imagine this type of terrifying course can be brilliant for team building but count me out – maybe I’ve just discovered a fear of heights! Next stop: Archery (ages 8+) All the kids were fully locked into this experience. Harry, the instructor was brilliant, engaging with the kids and talking them through the names of each part of the bow and arrow. Minnie had been desperate to experience archery for some time so was delighted to finally pick up a bow. Not as easy at it looks, it’s clear that archery takes some time to master. I imagined I was heroine Katniss from The Hunger Games, although sadly my aim left a lot to be desired…. Next up: Zorbing – something my patient 5 year old Bo had been waiting for. Thrown into an inflated luminous pink cyclinder on water and told to run like a hamster – what could be more fun? Safely secured on the other end of a rope, the two girls scurried away with fits of laughter and came off 10 minutes later with exhausted smiles – highly recommended for younger children with low thrill, high fun factor. Ratty from Wind in the Willows perfectly sums up my idea of a great day. My recent sailing adventures have sparked a wish to get my girls into dinghy sailing. Perfect for sailing newbies, dinghy sailing here gets kids to grips with the basics of wind and sails in a safe lake environment. We took out two tiny Laser Picos which fit one adult and a child comfortably. Taking control of the rudder my 5 year old excitedly steered us around the beautiful lake, whilst I attempted to capture what wind there was into our sail. With sudden gusts of wind, we heeled on our side and skimmed at high speed over the water – so fantastic to introduce sailing to her for the first time. We had a fantastic day and waved farewell with weary smiles on our faces. 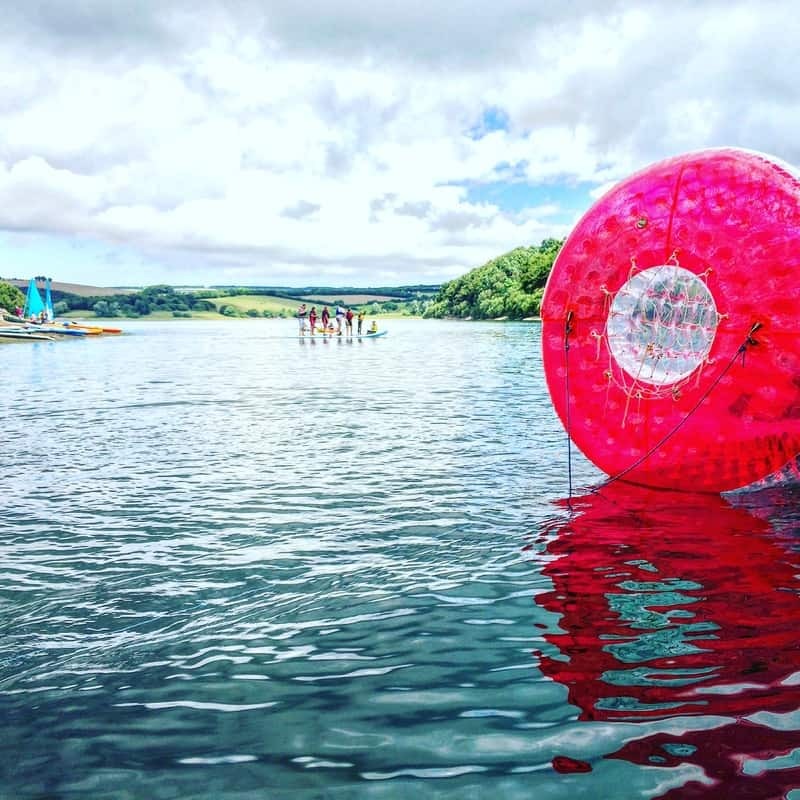 The Family Freestylers highly recommends the Outdoor + Active Centre at Wimbleball Lake, Exmoor to other families looking to try new outdoor activities, or for those who like us adore outdoor pursuits. With the sheer scale of activities on offer, the friendly instructors and stunning lakeside location it’s a no brainer to visit AND we love the fact there’s a campsite slap bang onsite so you can make a weekend of it. Check out their awesome new camping pods below! Whilst the emphasis is definitely on older kids (age 8+) there are still activities to keep younger ones happy (woodland playground, zorbing, cycle track to dam (2km each way), kayaking (with an adult in a double kayak), dinghy sailing (with an experienced adult), rowing boats etc). The 4km round walk to the impressive dam is also stroller friendly.There are also some excellent kids courses on offer during the Summer – sign up for a Wet n’ Active Day (£35.00) or a indulge in a whole Wet n’ Active week (£150.00) where your child can adventure to their hearts content and get to experience a little of everything the Centre has to offer. Mega SUP – get your whole family and more onto a Mega SUP – guaranteed fun! Now we’re in the know about this fabulous facility (a mere hour from us), only 20 miles from junction 27 of the M5, we’ll definitely be booking back in soon.Needing inspiration for family stuff to do during the Summer Holidays? This one’s a winner and guaranteed to put a smile on the your little dare devils faces. Outdoor + Active are located at 5 lakes in the South West. Choose your closest on the map below. Whilst we were the guests of Outdoor + Active, Wimbleball Lake, all opinions are, as always, our own. Thanks for your review on Outdoor + Active, it looks like a very interesting and exciting place to try out when in Somerset. It’s a perfect place to get active in the picturesque surrounds of Somerset. With all the glorious natural formations in Somerset, it’s an ideal place to holiday for summer. Thanks Jane. I’m glad you liked the post. We loved Outdoor+Active – so many activities to do with the kids and we love being near the lake. Watch out for our review of one of their camping pods this week on our blog.